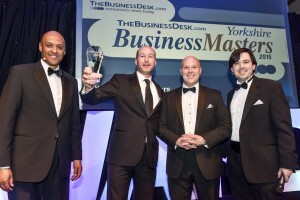 J&C Joel, one of the world’s leading manufacturers of flame retardant fabrics and flooring for the entertainment and event industries, is celebrating after being recognised as Yorkshire’s best Small/Medium Exporter. As well as picking up the award at this year’s Yorkshire Business Masters awards, which celebrates the achievements of businesses operating in the Yorkshire region, J&C Joel has also joined the Made in Britain Campaign, showing its dedication to providing UK manufactured goods worldwide. J&C Joel has been providing bespoke theatre curtains, drapes, canvasses, backdrops and stage engineering services for stage shows, events and exhibitions for more than 35 years, with export sales accounting for more than 62% of total sales for the J&C Joel Group. The company currently exports to more than 75 countries worldwide. Though the company has achieved worldwide reach through an international network of offices in Europe, South Africa, Middle East, Macau and Hong Kong, J&C Joel is renowned for celebrating its British heritage and values, and is one of the most recent companies to join the Made in Britain Campaign.